Prehistoric hunter-gatherers were the first inhabitants, followed by the Plains Apache. Modern Apache tribes followed them and were displaced by Comanches. The Comanches were defeated by the United States Army in the Red River War of 1874. Spanish conquistador Francisco Vásquez de Coronado explored the Llano Estacado in 1541. 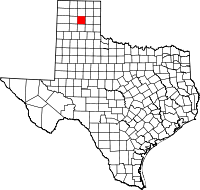 Carson County was established in 1876 from Bexar County. The county was organized in 1888. Panhandle, the only town at the time, became the county seat. Ranching began to be established in the county in the 1880s. The JA Ranch encompassed over a million acres (4,000 km²) within six adjoining counties. Richard E. McNalty established the Turkey Track Ranch in 1878. One of the early failed attempts came in 1882 when Charles G. Francklyn purchased 637,440 acres (2,579.6 km2) of railroad lands in adjoining counties to form the Francklyn Land and Cattle Company. The lands were later sold to the White Deer Lands Trust of British bondholders in 1886 and 1887. Railroads began to reach the county by 1886 when the Atchison, Topeka and Santa Fe Railway subsidiary Southern Kansas Railway extended the line into Texas, making Panhandle City a railhead in 1888. In 1889, the Fort Worth and Denver Railway linked Panhandle City with Washburn in Armstrong County. In 1904 the Chicago, Rock Island and Gulf bought the line. In 1908 the Southern Kansas of Texas extended its line from Panhandle City to Amarillo, thus making the Kansas-Texas-New Mexico line a major transcontinental route. The Choctaw, Oklahoma and Texas Railroad built across the southern edge of the county. Pumping underground water with windmills resolved the issue of bringing water from Roberts County via the railroad. White Deer in 1909 became home to Polish Catholic immigrants, who had first settled Panna Maria in Karnes County before migrating to Carson County. Experimental drilling by Gulf Oil Corporation led to the county's, and the Panhandle's, first oil and gas production in late 1921. Borger field was discovered in 1925, sparking much oil exploration and production of the Panhandle area. By the end of 2000 more than 178,398,900 barrels (28,363,160 m3) of petroleum had been produced from county lands. In September 1942 the Pantex Ordnance Plant was built on 16,076 acres (65.06 km2) of southwestern Carson County land, to pack and load shells and bombs in support of the World War II effort. Operations ceased August 1945, and in 1949 the site was sold to Texas Tech University at Amarillo for agricultural experimentation. Pantex reopened in 1951 as a nuclear weapons assembly plant. In 1960, Pantex began high explosives development in support of the Lawrence Livermore National Laboratory in California. Pantex has a long-term mission to safely and securely maintain the nation’s nuclear weapons stockpile and dismantle weapons retired by the military. According to the U.S. Census Bureau, the county has a total area of 924 square miles (2,390 km2), of which 920 square miles (2,400 km2) is land and 3.9 square miles (10 km2) (0.4%) is water. As of the census of 2000, there were 6,516 people, 2,470 households, and 1,884 families residing in the county. The population density was 7 people per square mile (3/km²). There were 2,815 housing units at an average density of 3 per square mile (1/km²). The racial makeup of the county was 93.82% White, 0.58% Black or African American, 1.00% Native American, 0.14% Asian, 0.02% Pacific Islander, 3.04% from other races, and 1.41% from two or more races. 7.03% of the population were Hispanic or Latino of any race. In terms of ancestry, 25.0% were of German, 14,2% were of Irish, 8,1% were of English, 4,7% were of American, 3,2% were of Scottish, 3,1% were of Polish. There were 2,470 households out of which 35.80% had children under the age of 18 living with them, 65.30% were married couples living together, 8.10% had a female householder with no husband present, and 23.70% were non-families. 22.30% of all households were made up of individuals and 11.30% had someone living alone who was 65 years of age or older. The average household size was 2.60 and the average family size was 3.04. In the county, the population was spread out with 27.90% under the age of 18, 6.20% from 18 to 24, 26.30% from 25 to 44, 23.90% from 45 to 64, and 15.70% who were 65 years of age or older. The median age was 39 years. For every 100 females there were 95.80 males. For every 100 females age 18 and over, there were 92.20 males. The median income for a household in the county was $40,285, and the median income for a family was $47,147. Males had a median income of $34,271 versus $23,325 for females. The per capita income for the county was $19,368. About 5.40% of families and 7.30% of the population were below the poverty line, including 8.90% of those under age 18 and 9.40% of those age 65 or over. ^ Abbe, Donald R (2010-06-12). "Carson County, Texas". Handbook of Texas Online. Texas State Historical Association. Retrieved 16 December 2010. ^ Donoghue, David (2010-06-15). "Francisco Vázquez de Coronado". Handbook of Texas Online. Texas State Historical Association. Retrieved 16 December 2010. ^ "Panhandle, Texas". Texas Escapes. Texas Escapes - Blueprints For Travel, LLC. Retrieved 16 December 2010. ^ Anderson, H Allen (2010-06-15). "Turkey Track Ranch". Handbook of Texas Online. Texas State Historical Association. Retrieved 16 December 2010. ^ Anderson, H. Allen (2010-06-12). "Francklyn Land and Cattle Company". Handbook of Texas Online. Texas State Historical Association. Retrieved 16 December 2010. ^ "Duncan Ranch History". The Duncan Ranch. Archived from the original on 2011-07-08. Retrieved 16 December 2010. ^ "The Atchison, Topeka and Santa Fe Railway, Santa Fe All The Way!". American-Rails.com. Retrieved 16 December 2010. ^ "The Chicago, Rock Island and Pacific Railroad, Route of the Rockets!". American-Rails.com. Retrieved 16 December 2010. ^ "Windmills". Texas Escapes. Texas Escapes - Blueprints For Travel, LLC. Retrieved 16 December 2010. ^ "White Deer, Texas". Texas Escapes. Texas Escapes - Blueprints For Travel, LLC. Retrieved 16 December 2010. ^ "Panna Maria, Texas". Texas Escapes. Texas Escapes - Blueprints For Travel, LLC. Retrieved 16 December 2010. ^ Warner, C A; Thompson, Ernest O (2007). Texas Oil & Gas Since 1543. Copano Bay Press. p. 256. ISBN 978-0-9767799-5-7. ^ "Borger, Texas". Texas Escapes. Texas Escapes - Blueprints For Travel, LLC. Retrieved 16 December 2010. ^ Makhijani, Arjun; Hu, Howard; Yih, Katherine (2000). Nuclear Wastelands: A Global Guide to Nuclear Weapons Production and Its Health and Environmental Effects. The MIT Press. pp. 233–239. ISBN 978-0-262-63204-1. ^ Norris, Robert S (October 1992). "Pantex Lays Nukes to Rest". Bulletin of the Atomic Scientists: 48, 49.